An increase in the number of women playing sport has driven improved participation figures, according to the latest survey by Sport England. People regularly playing sport stands at 15.74 million over 12 months, a rise of 1.65 million since 2005/06. Bucking the normal trend, the number of women playing sport and being active is increasing faster than men. Swimming remains the top sport overall but continues to decline, with athletics a close second and rising. Sport England's Active People Survey began in 2005/06 and measures the number of people taking part in sport across the nation, with findings published every six months. There was good news for tennis, cricket, boxing and rugby union, with increases in the numbers taking part but football and cycling experienced falls. Participation figures for lower socio-economic groups and disabled people were low and remain static. "It's good news that more women are playing sport, and driving an overall increase in the numbers," said Jennie Price, Sport England's chief executive. "It's particularly great to see This Girl Can is making a real difference. That's because we've really focused on what drives women's attitudes and behaviours. "If we're to see a further step change in the total number of people playing sport, we need to take a similar, consumer-focused approach in areas where the figures are stubbornly low, like disability and lower socio-economic groups." Gender: 8.73 million males aged 16 years or over (40.7%) played sport once a week during the period October 2014 to September 2015, an increase of 949,600 since 2005/06; 7.01 million females aged 16 years or over (31.2%) played sport once a week, an increase of 703,800 since 2005/06. 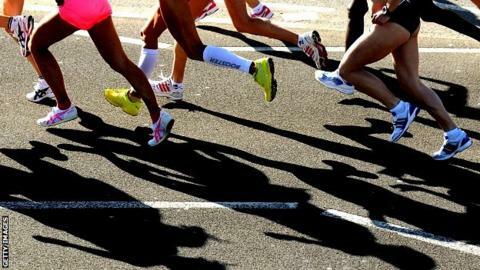 Athletics: The sport with the biggest improvement saw a rise of 98,700 to 2.3 million, much of it driven by more women taking part in running. Swimming: Price had said she was "very concerned" by the previous set of participation figures in January, and the decline continues, albeit at a slower pace. The latest fall of 39,300, to 2.51 million, was "welcomed, [but] the sector has much more to do to reverse its fortunes." Tennis: A week after the Lawn Tennis Association came in for criticism from Andy Murray, among others, for its lack of success in bringing through junior players, the governing body can at least point to continually improving participation figures. The LTA had funding cut by Sport England in 2012 as participation declined, but the latest figures show 22,800 more people aged 16 and over - a total of 445,200 - played once a week.